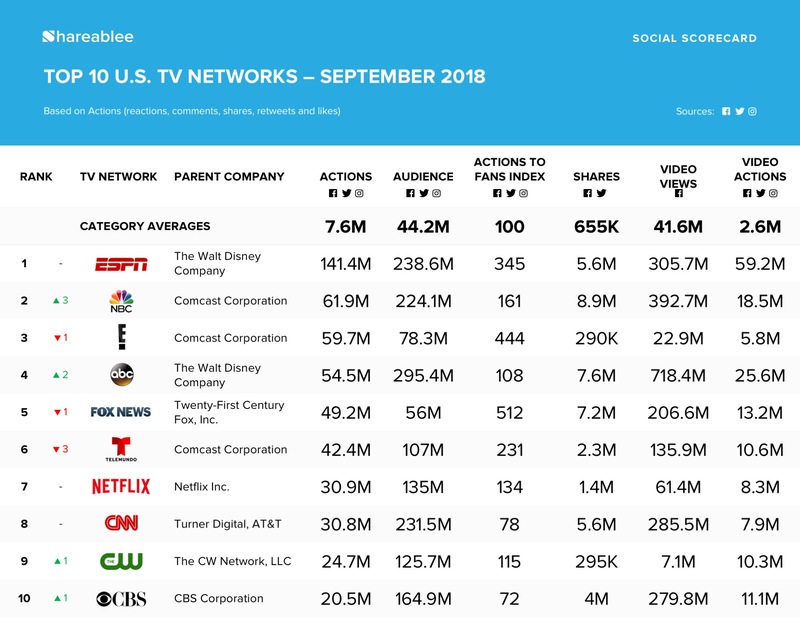 NEW YORK, October 9, 2018	(Newswire.com) - Shareablee Inc., the global leader in audience-based social media measurement, today released their ranking of the most socially engaged American TV networks for September 2018. 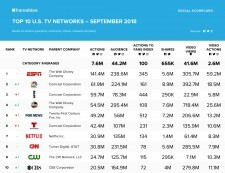 The ranking, which includes all television shows and all main network brand accounts under their respective networks, reflects a total of 742.9 million actions across Facebook, Twitter, and Instagram. The top-ranked Primetime TV shows on social media last month were "Grey’s Anatomy" on ABC ( 11.6 million actions), "Sin Senos Si Hay Paraiso" on Telemundo (10.4 million actions), "America’s Got Talent" on NBC (10.1 million actions), "American Horror Story" on FX (5.8 million actions), and "Entertainment Tonight" syndicated by CBS (5.6 million actions).